Western and Eastern approaches to spirituality differ in their accents on what to do with the ego – that separate center of personal identity that each of us cherishes as “I, myself.” The challenge in both cases is presented in the condition of duality, which is a consequence of separating into our own identity, known in psychology as individuation. As long as the individuation process has been successful in forming a centered personality, ego can serve as a point of release into the grounding mystery of being within, as well as a launching point for transpersonal engagement in genuine community. These two “options” for the well-centered individual are the Eastern and Western accents, respectively. In Western spirituality the (outward, extroverted) rise into community has been the favored way, while in Oriental spirituality it is the (inward, introverted) drop into the ground of being-itself. 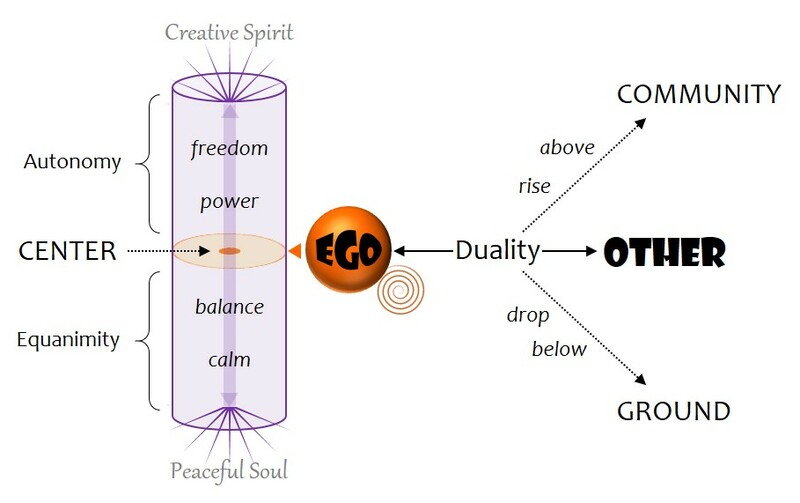 In my diagram I have illustrated these two complementary paths of spirituality as they break through the duality of Ego and Other. One path takes identity up into relational unity (community) and the other releases it for a deeper experience of the grounding mystery (ground). It’s important to see these as truly complementary and not mutually exclusive alternatives; both are equally available to the well-centered individual. I won’t spend much time on it here, but that orange spiral is a reminder that not all of us get to this point. Instead, our chronic insecurity drives us to attachment, which in turn complicates into entanglement and ultimately a state of delusion where we are absolutely convicted in our belief that it’s all about us. All of our energy gets knotted up around (and around) these neurotic ambitions, making us anxious and frustrated, then leaving us exhausted … until it’s time to go at it all over again. Because we are stuck on ourselves, the two spiritual paths are closed behind locked gates. To the true believer of popular religion this will sound like esoteric code-speak, when it’s really they who have removed themselves from the simple truth at the center of their experience. When we are properly centered, these deeper and higher dimensions of the spiritual life are open to us. We are secure enough within ourselves and consequently don’t need to latch on to others and wait for salvation. What we might call the virtues of a centered life are an inner calm and emotional balance, along with personal power and creative freedom. The first pair of balance and calm can be summarized as “equanimity,” while the second pair of power and freedom combine in “autonomy.” Together, then, equanimity and autonomy are what the centered life enjoys. My diagram also pulls forward from a recent post Peaceful Soul, Creative Spirit the idea that human spirituality is essential to our wellbeing. Instead of seeing these as parts of us, or as the “true self” separate from our body, I have been arguing for definitions that appreciate soul and spirit as the inward-existential and outward-transpersonal aspects, respectively, of a uniquely human spiritual intelligence (SQ). I also regard our spiritual intelligence as activated or awakened only to the degree that we have achieved ego strength, where a stable center of identity provides the point from whence we can drop into the grounding mystery or rise into genuine community. By this definition, a human newborn does not yet possess such an access point since an ego is still in its developmental future. A human adult who is neurotically self-involved will be prevented access for a different reason. For neither one is spirituality an active force in experience. Just as the other threads of our Quadratic Intelligence (visceral, emotional, and rational) “come online” during critical periods of development, our spiritual intelligence is not only the last to awaken, but its full awakening depends on the successful formation of a well-centered ego. Only from there can we cultivate an inner calm, manage our internal balance, develop personal power, and express our creative freedom. It is as if a well-centered identity opens a channel for our spiritual life to flow. Stepping back out of the details for a broader view, it should be clear by now that what I earlier called the challenge of duality is crucial to understanding the human condition, our progress or arrest in ego development, the complications that spin us in neurotic directions, and the Shining Way to a liberated life. Whether we take the ‘Western path’ to genuine community or the ‘Eastern path’ to the grounding mystery – ascending or descending, outward or inward, ethical or mystical, transpersonal or existential – we need to be secure enough and sufficiently centered in order to get over ourselves. And whether we choose to take one path or the other, eventually we’ll need to come back to that center again. So let’s be mindful of keeping the porch swept and trash away from the door. Just now human beings are blustering and posturing across oceans and national borders, provoking each other to acts of violence in the name of their respective (and disrespected) gods. Whether a god goes by the name of Allah or Yahweh or Security or Prosperity or Supremacy, its devotees appear ready and willing to commit every conceivable atrocity on its behalf. Personal identity (ego) is inherently insecure to some extent, and the more insecure it is, the more aggressive its attachment to external stabilizers becomes. Such neurotic attachments inevitably collapse the ego’s horizon of meaning to those “absolute truths” which justify and protect them. Ego’s god, by whatever name, is both the patron deity and divine guarantor of this arrangement. So we’re stuck. There’s no getting out alive, and some of us seem just fine with that prospect. There’s something better on the other side – either a future victory for our cause and inheritance for our children, or a posthumous reward in the next life. Winning. As long as we only keep eyeballing our alter egos and rattling sabers, this situation will never change for the better – and I don’t mean better for ‘me’ only but better for us all. What needs to happen is that we change our perspective on what’s really going on. One aspect of it is this aggressive competition between egos for what will pacify our insecurity, protect our attachments, and preserve the meaning of life as we know it. But if we were fully centered and at peace within ourselves, would we be conspiring to pull the rugs out from under each other? This notion of centeredness and inner peace serves to shift our perspective to a deeper mental location, one that’s not about our relationships to ‘the other’ and the world around us. Each of us has an interior life where our existence reaches into the very ground of being and stands out (the literal meaning of exist) as its unique manifestation. At this level we are far below the staging area of personality and Captain Ego; and the deeper our contemplation goes, the less of ‘me’ there is. Within this being or that being, within me and within you is the grounding mystery – the possession of no one and creative source of all. It’s important to understand that the grounding mystery (or ground of being) is not outside the self but profoundly interior to it. Although the religions may represent it as a cosmic creator, supreme provider, moral lawgiver, benevolent will, or governing intelligence, the grounding mystery is literally nowhere and is no thing – it does not ‘exist’! Because it is the inner essence of all things, our existence (including the ego) is its expression, and our only access to it is by the inward path of contemplative release. If we talk about it – just as, in a sense, our individual existence articulates the grounding mystery as you or me – we must be careful not to idolize our representations and mistake them for the mystery itself. The inward descent of contemplation requires a surrender of ego (of the ‘I’ who is doing this) and involves a gradual dissolving-away of all distinctions, to the point where nothing remains but an unbounded present awareness. Here we come to the realization that this moment is eternal – not a mere interval in a possibly everlasting sequence of time, but outside of time altogether: an Eternal Now. There is neither ‘me’ nor ‘you,’ here nor there, past nor future; only … this. From this vantage point we also become aware of the fact – we might call it the Fact of facts – that All is One, that because all things are individually grounded in the present mystery of reality, together they manifest its creative energy in the manifold (“many folds”) of a universal order (or universe). As we allow our contemplation to open out and ascend in this fashion, we enter yet another mental location of consciousness: not an inward and mystical release to the grounding mystery, but not the personal (and interpersonal) perspective of ego, either. What we call “universe” is the unity of existence, not merely the sum total of all things but a consilience of higher wholeness, in which each thing participates and to which each thing contributes a unique expression of being-itself. I have advocated for this term consilience as an urgently needed and therefore timely notion that can foster a shared understanding and responsibility for our place in the greater web of life (or any system). This is where we see that all our aggressive competition and reckless consumerism, while perhaps hurting our enemy or keeping us comfortably in fashion, is actually compromising the health of living systems on which we depend. But how can we think like the universe and act out of a higher wisdom if we are mired in these local conflicts over security, attachments, and meaning? As long as we persist in pushing on each other, reacting and provoking further reactions, how will we ever find the solitude where we can drop into being and behold our communion with all things? Is it possible to keep one eye open and fixed on our enemy, as we contemplate the present mystery of reality with the other? In some sense, this is precisely what our religions are trying to do. But it doesn’t work, and never will. Each of us must take the initiative by going within to the grounding mystery and beyond to the provident universe. Only as we are able to reconnect consciousness to the reality on either side (so to speak) of this fantasy of ‘me and mine’ will we stand a chance of moving together into a brighter future for us all. With a change of perspective, new opportunities become available. But not until then.